What? The Nintendo Switch, the convertible console formally known as the NX. The product walks the line between a home and portable console, courtesy of a docking tablet and a pair of detachable controllers that work in a number of different configurations. 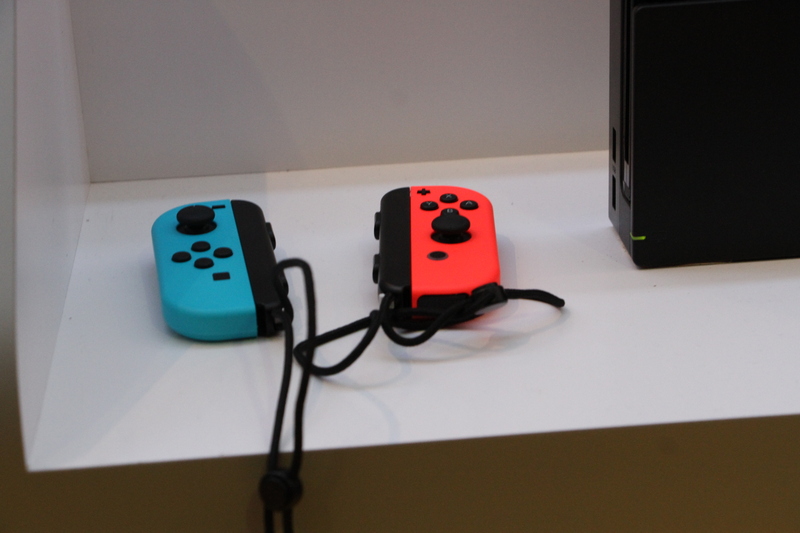 It also features out-of-the-box multiplayer functionality, connecting up to eight devices via Wi-Fi. How much? The U.S. MSRP for the system is $299. That’s a fairly high price point for a company like Nintendo that has found a lot of success undercutting the competition. It does put it in line with Wii U’s launch price, though that ultimately seemed like a misfire for the company, which cut the cost by $50 the following summer. When can I get one? If you missed the early availability at Target, Best Buy and Walmart — bad news, it seems to be sold out for now. It’s starting to feel like the NES Classic all over again. But hopefully Nintendo will have its ducks in a row by the time the system launches for real at retail on March 3. And according to Darrell, you don’t really have a choice in the matter. What’s in the box? The system is launching with two SKUs here in the States — but the contents are essentially the same, the only distinction being the color of the Joy-Con — in one configuration they’re dark gray (matching the rest of the system), in another, a more colorful, Mario-themed blue and red. What games will be available at launch? There will only be two Nintendo-developed games at launch: the long-awaited new Zelda game, Breath of the Wild and 1-2 Switch (apparently initially intended as a Wii U title), a brand new title that’s actually a collection of mini-games designed to showcase the system’s creative control scheme. Among the 1-2 Switch games is a dual-style shooting game, which, like the rest of its contents, is intended to be played with players facing toward one another, rather than the screen. Also available at launch are the third-party titles Skylanders Imaginators (Activision) and Just Dance 2017 (Ubisoft). Each offers its own interesting bit of gameplay; the former utilizing the series’ customary toys-to-life figures, the latter using full-body dance controls. What’s coming? Nintendo of America President Reggie Fils-Aimé noted onstage in New York today that the company is working with 50 developers to bring around 80 titles to the console. For now, we’ve only seen a fraction of those announced, though many were on hand at today’s event. Splatoon 2, NBA 2K18 and Elder Scrolls V: Skyrim will be available in the fall/summer and Super Mario Odyssey will arrive in time for the holidays. Games will run $60 a pop. Here are a bunch of trailers to tide you over. What about specs? I’m glad you asked. The console/tablet has a 6.2-inch 720p touchscreen. The resolution gets better when docked, outputting at 1080p on a screen through an HDMI connection. Inside, you’ll find a fairly anemic 32GB of storage, augmented via microSD cards and a custom NVIDIA Tegra processor. The battery estimates are pretty broad — between 2.5 and six hours as a portable console, game dependent. Zelda, for example, falls toward the lower end of the spectrum at around three hours. The Joy-Con controllers should last considerably longer as a standalone — at around 20 hours a piece. The system charges while docked or via the USB-C port on the go. What about getting online? The company will be launching an online subscription service akin to the Xbox One and PlayStation 4. It will be free at launch for a limited time, with an as of yet unannounced monthly fee kicking in during the fall. The company will be offering access to NES and Super Nintendo games via the service, with more content and features set to be announced in the future. Is it fun? Yeah, it’s pretty fun. Mario Kart is great. Did Nintendo learn its lessons from the Wii U? Yes and no.